In the Boy’s High School, I coordinate the Christian Service Program by planning service trips for 700 students and then take them in groups of 14. After school, I am the head JV and Varsity Bowling Coach. 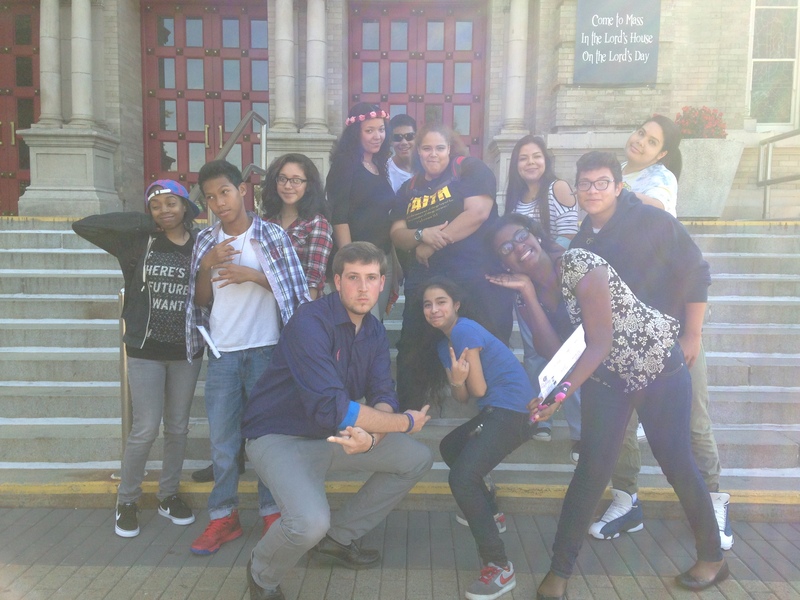 As the Youth Minister in the parish, I started the Youth Ministry program and facilitate the Youth Group each week for 30 high school students. After a week of being the “new teacher” at the Boy’s High School, I quickly learned that students wanted a faculty member that they could talk with about everything from video games to stress at home, from school to sports, and faith. That weekend, I purchased several bags of candy and a bowl. Monday morning, I put the bowl full of candy on the corner of my desk. Soon, students were coming in like crazy. I began learning their names and getting to know each one of them. Since those first weeks, the candy bowl still sits on my desk, but students hardly come in just for candy anymore: they pull up a seat and talk about whatever is on their mind. The guys come in with me asking, “What’s the good word?” but leave talking about what’s on their hearts and minds. I get to hear about their lives and give them advice on relationships with girls, family, God, and one another. It is a massive privilege that wasn’t listed in my job description. These caring, sensitive, sometimes tough young men needed someone who was willing to listen. The needs of the parishioners in regards to the Youth Ministry Program were much different. The high school aged children of St. Raymond Parish needed a community in which they could grow with their peers. I knew instantly that the students needed a space within the parish that they could call their own and grow in their faith. I worked with the pastor to designate a conference room in the lower church to be used exclusively for the Youth Group. I sought donations to create an atmosphere that teens could feel comfortable in. Shortly after, the original conference room (having just folding tables and chairs) was transformed into the new Youth Room- a space fully furnished with couches, chairs, lamps, tables, food, and games. The final need was getting the opportunity to meet other students and grow with them in their faith. The Youth Group Kick-Off Event gathered over 60 students. Currently, a regular group meets each week for catechetical programing, games, and fellowship. The group does service and has taken a liking to one another! Both programs are new, so they have definitely filled different needs in the community. Have you noticed any signs of success in your work? Before working at the Boy’s High School, the Community Service Program required students to complete a set number of hours and a reflection paper. The students did not like doing the service, which contradicted the original goals of the program. They needed a service program they enjoyed and benefitted from. I completely reimagined and restructured the program beginning with the name. I changed the program’s name to “Christian” Service Program to emphasize the fact that St. Raymond students serve because Christ calls His followers to do so. Community Service is something that courts require. Unlike punishment, students have been enjoying the service that they do. The new program gets them in the community and working alongside their classmates. They have a lot of fun getting to know one another outside the classroom and getting their hands dirty. The new program also synthesized experiences outside of the classroom with knowledge learned in school. This “experiential learning” fosters development for students to be better prepared for a holistic college education. Many students understand the connection between the service requirement and their faith, so that in itself is a major success. The neighborhoods of the greater Bronx are witnessing St. Raymond’s students serving the community. Many of our sophomores serve at Serviam Gardens, where my community members and fellow LVs Katie Christensen and Bryana Polk serve. For the past several weeks, students have been asking me if I will be working at St. Raymond next year. I want to tell them that I would work at St. Rays for 35 years if I could. The students, administrators, and pastor have all asked me to return next year, so I see that as another sign of success. As the Bowling Coach, I have had a few successes as well. First, both teams have been winning. I have brought freshman on the teams to play alongside the older guys. I bought the teams their first ever uniforms. 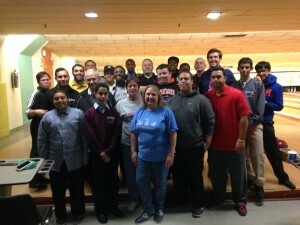 Everyone looks great at games proudly wearing their Nike St. Ray’s Bowling Uniforms. Additionally, I planned the first “Bowling Team vs. Faculty” bowling match. Fifteen teachers, including the Brothers and Principal, bowled against the bowling team. Everyone had a great time smack-talking, high-fiving, and laughing. There was a lot of St. Ray’s pride that day. This is a year of firsts for me and for St. Ray’s, so much of it feels like a success. How has your involvement with the Brothers affected you? 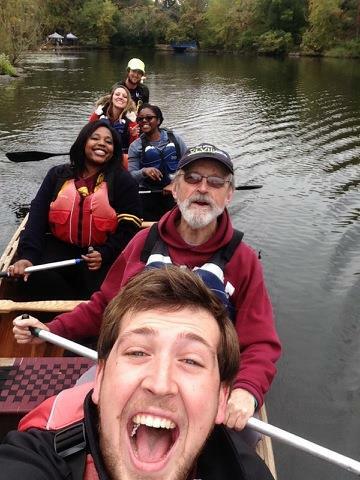 Steven (Front) canoeing with community members and fellow LVs. As an LV who has not come in contact with the De La Salle Christian Brothers before committing to a year of service, I cannot speak higher of my relationship with the Brothers. I am fortunate enough to get to live with completely different Brothers than I work with. The Brothers at St. Raymond are my support system at school. It always seems as though they are looking out for me and giving me a helping hand when I need it. One might think that working with different Brothers than I live with would mean that I know them on different levels. On the contrary, I eat dinner with the St. Raymond Brothers bi-weekly, go out on weekends with them, and have attended a co-worker’s concert together. This regular time with the Brothers that I don’t even live with shows how much they appreciate having an LV at St. Raymond’s and how fortunate I am to work with them. They make St. Raymond’s even more fun than it already is! At home, Brothers Michael, Bill, Joe, and Ed are the guys I trust. Sharing the third floor with Br. Ed, I always have a chance to talk with him one on one about our lives and seek advice. Br. Bill is the kind of guy who can always make me think because he provides new perspective. Br. Michael reminds me a lot of my dad, so it is really nice to have that all around loving person in my life. He is always up for a good laugh or exchanging stories about St. Raymond (as he is an alum). Br. Joe always asks about my day. He makes a point to see what is going on and how my ministries are doing. Each one of these men has countless years in education and faith development. Coming home from school each day and the Youth Group on Sunday allows me to seek their advice on situations that they encountered in their time as tenured teachers. This guidance gives me the wisdom that many new teachers don’t have. When graduating in May, I knew I wasn’t mature enough to go and live with just post-grad volunteers who don’t know each other, just started their first teaching jobs, and moved to a new city–the Brothers are the ones who made each of those transitions seamless. I am quite thankful for each of them. Whenever I talk about living with the Brothers, I contrast it to not living with the Brothers as a post-grad volunteer. Not living with the Brothers is like going to a Yankees game to learn how to play baseball. However, when you get to the game, the Yankees just left their bats, balls, and mitts lying there for you to figure it out for yourself. Living with the Brothers is like playing with the Yankees. They show you the proper technique, good strategies, and how to work as a team. I for one would way rather play with the Yankees than learn baseball without any help. So too with living in an intentional faith community with the Brothers–I learn directly from the men who have committed their lives to educating the poor and practice their faith every day. This program has changed the way that I understand myself, my relationship with those who do not come from the same means I do, and my faith. Joining the LV family, I made 50 new friends with the same drive to serve that I have. We are committed to those we serve and support one another from across the country. This smaller family dynamic enables us to care for one another and care for the community at large. You might think that you want take a year off by post-grad volunteering, but this experience is farther from taking a year off than starting a salaried job. Living with fellow LVs and the Brothers provides a community that is second to none, and your service experience will make you wake up each morning excited to go to work. I would not trade my LV experience for anything. 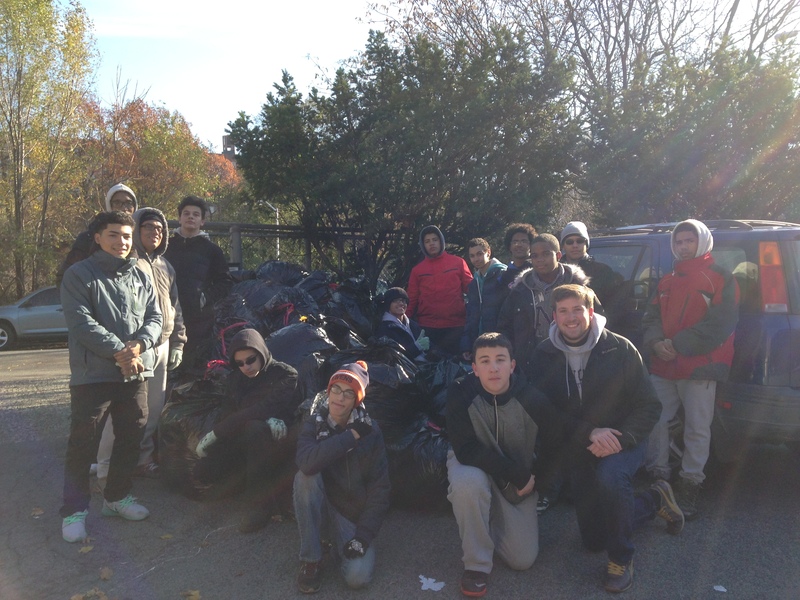 Raking leaves at Visitation Catholic Church for a Christian Service Trip. The Lasallian Community of Bedford Park invites guests to stay over on a regular basis. One time, I asked Br. Bill if guests make a contribution to the house after staying. He replied, “there is no need for these people to make a contribution because of the good work they do for our communities already.” A donation to the LV program is both a contribution to the work LVs do at their sites, but also to the communities who help members of the community serve as well. A donation to the LV program isn’t just one donation, but it is a donation that enables the LV community and the Brothers to help others who serve as well. The LVs are not the only people who benefit from a donation to the LV program, rather, those associated with the Lasallian community at large benefit from a donation! How would you like to continue your involvement with the Lasallian family after your time with the Lasallian Volunteers?